The TC 342 is a high spec Husqvarna garden tractor designed for landowners who frequently need an efficient and dependable ride on lawn tractor for really large areas all year round. It is a high-capacity tractor with integrated collection for demanding lawn care. Equipped with a Kawasaki FR Series Engine. 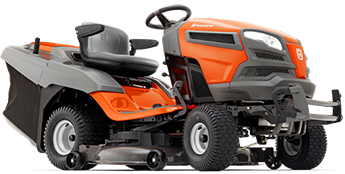 This quality Ride On Mower has an extra fast transmission for superior transport speeds. The pedal-operated hydrostatic transmission and the BioClip from seat functionality together with a cast front axle ensure convenient and trouble-free operation. The BioClip® from seat function makes it possible to change to mulch mode while still in the driver's seat.